Five years after Russia's annexation of Crimea, the Canadian Ministry of Foreign Affairs continues to support the sovereignty of Ukraine, calls on the Russian Federation to release political prisoners and lift the ban on the Mejlis of the Crimean Tatar people. "Today marks the fifth anniversary of Russia's illegal invasion and annexation of Crimea. 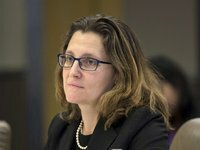 We continue to condemn this violation of Ukraine's sovereignty and territorial integrity in the strongest terms," Minister of Foreign Affairs of Canada Chrystia Freeland said in a statement made public on the website of the Canadian Foreign Ministry on Saturday. The foreign minister noted that for five years, the world had witnessed a severe suppression of human rights in Crimea—committed by Russian authorities—including arbitrary arrests, torture, detentions, disappearances and the suppression of freedom of expression and association. "Canada is deeply troubled by the persecution of Crimean Tatars and other minorities. We denounce the banning of the Mejlis, the self-governing body of Crimean Tatars, and call on Russia to reverse this illegal and immoral decision," the statement reads. Freeland stressed that Canada continues to call for the release of political prisoners held by Russia, including Oleh Sentsov. "Canada is committed to supporting the people of Ukraine. Yesterday, Canada and its allies announced new sanctions against 129 individuals and entities, many for their direct involvement in the illegal annexation of Crimea. Together with the international community, we will continue to maintain pressure, including through economic sanctions, until Russia respects Ukraine's sovereignty and international law," the minister summed up.